Come find out how it feels to be come a legend at WWE Legendary we are growing fast so come join up while you can. Strongest and most Original fed on Chris Hart's. You look around, and all you see is cheap rip offs from WWE. Why not try something with originality? Our staff beats theirs by far, and RPers have much better talent. Give it a shot, this isn't a lie. The best E-Fed. 2 shows a week, monthly Pay Per Views that set the standard. We have a school to help you improve your skills. EBWF - Crushing the competition since 2001! Welcome to the EBWF! We are a real wrestler efed that's been going strong for 12 years+! 1 show/week, all results handwritten. Come check out our awesome website and see what we're about for yourself! Taking Over The World Is Easy!! Total Nonstop Action: Rise to Glory is all about roleplaying and having fun.We are looking for active members who love to have fun.Members and staff are very freindly.Good GFX.So come join and be apart of the Total Nonstop Action and Rise to Glory! We Are A Top New Fed With Great Roleplayers, Some Top Named Superstars Are Still Available! Extreme Wrestling Empire has been founded in 2009. We welcome people with all kind of experience. Over the years EWE has developed to be a community of very close friends, which we take pride in. OSW is Old School e-fed. We're looking for gimmicks, just like the Attitude Era and pride ourself on being Retro. Come check out uXwA. 2 weekly shows, with each show having 5 championships each making it 10 total and a monthly PPV for each show! 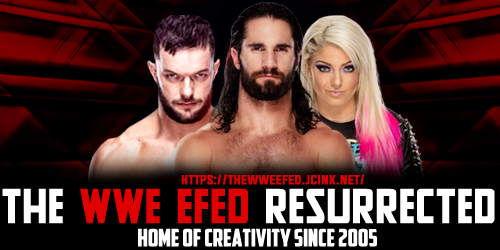 THE Best looking Efed on a proboards forum. Come join and be apart of it. you can be a real wrestler or diva or create one of your own. we have a guide to help. come join in what could be the next level in RPing.